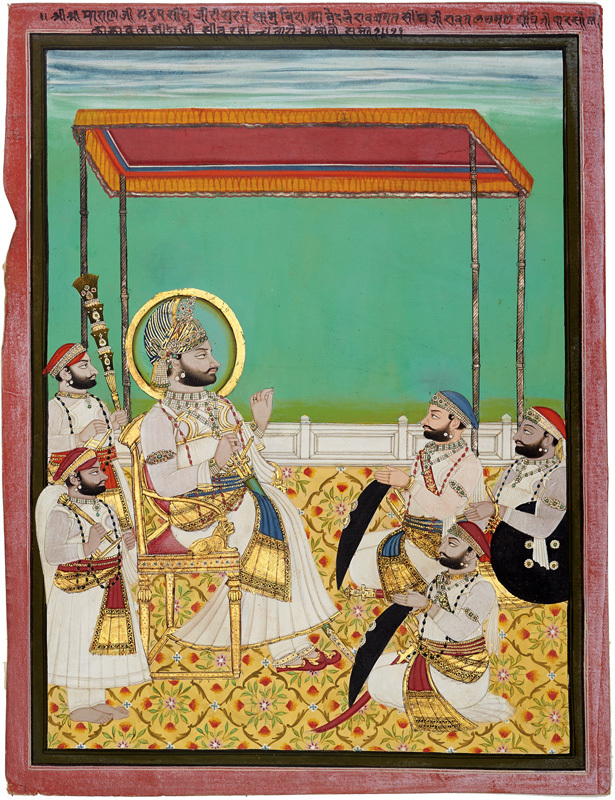 Maharana Swarup Singh is conducting court on a terrace and makes a vitarka mudra (preaching or discussion gesture) in front of his courtiers. He is known to have made many reforms in the political, cultural and social spheres like abolition of sati and freely supported and gave refuge to British in Mewar. He was adopted by his brother Sardar Singh as the latter had no children. Rawat Bakhat Singh of Bedla, Rawat Laxman Singh of Parsoli and one of his uncles, Dal Sing of Shavrati attend his court and are shown seated on the floor in front of Sarup Singh. He is depicted in his royal self as dressed in a fine white and golden outfit and decked with gold-pearl jewelry and as seated on a chair (and not on a traditional gaddi set up). The background against the terrace is bright green (which is often known as ‘tara green’ as this particular shade of green was popularized by master artist Tara). Artist Ambavo worked in the workshop of master Tara and followed his style and colour palette, but could never match the dexterity and finesse of his master.